Spider's webs intrigue me, but none more than this one. I mean check out that zig-zagging...it's better than a sewing machine! You can find out about them at the Australian Museum's website here. 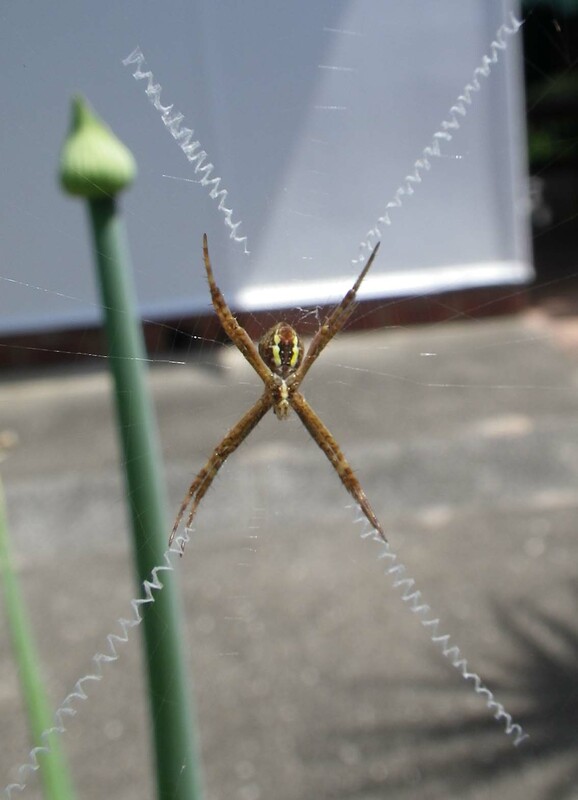 They're named after the patterns they make in their web. The yellow and red on the abdomen indicate that this is a female - the males and smaller and brown and cream. Oh, you mightn't see these in WA, Lily, as it says they're only in NSW, Qld and Vic. Mating occurs from summer to autumn. The male sits in the corner of the web and attracts the female by vibrating a mating thread it's previously attached to the web. If the female is unreceptive, she may attack him. If not, mating occurs and the egg sac is placed into these threads often among leaves. I have lots of spiders in my yard and I really enjoy them. Mr E on the other hand is quite terrified of spiders and does this incredible panic-dance when he touches a web. I really do try not to laugh, but I usually fail!